LINQ will be fully integrated with the next release of Visual Studio (code-name: Orcas) and it will include some very cool framework and tool support (including full intellisense and designer support). Last week the LINQ team released the May CTP drop of LINQ that you can download from here. What is cool about this CTP is that it works with VS 2005, and allows you to start learning more about it immediately. It incorporates a bunch of customer feedback (for example: support for stored procedures in DLINQ), and also includes a built-in ASP.NET Web-Site Project to enable you to leverage it with ASP.NET apps (note: you can also use LINQ with the new VS 2005 Web Application Project option as well). I’m going to put together a few blog postings over the next few weeks that show off ways to use LINQ/DLINQ/XLINQ within ASP.NET projects. This first walkthrough below will help you get started and introduce some of the important LINQ concepts. You can follow-along by downloading the May CTP LINQ preview above and typing in the code below (I list all of it below), or you can download and run the complete .zip file of my samples here (note: you still need to install the LINQ May CTP drop for the .zip file of samples to work). Note: LINQ, DLINQ and XLINQ will be fully supported in both C# and VB. I am using C# for the example belows. Note that the C# 3.0 compiler and CodeDOM provider can run side-by-side with the C# 2.0 versions (so you don’t have to worry about it breaking VS or ASP.NET when you install it). 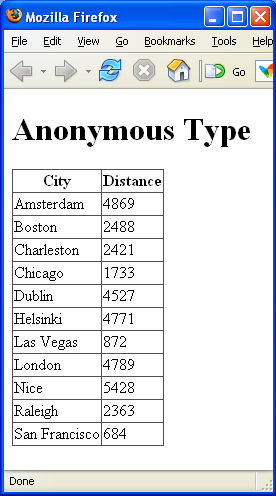 In the above sample I’ve created an array of strings listing the cities I’ve visited from Jan->May of this year. I’m then using a LINQ query expression against the array. 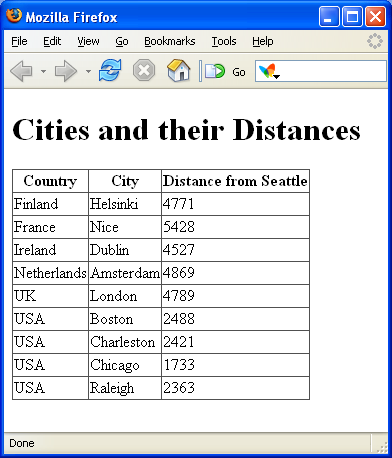 This query expression returns all cities where the city name is greater than 4 characters, and orders the result in alphabetical order and transforms those city names into upper case. Note that instead of using the GridView control I could have just as easily used the <asp:repeater>, <asp:datalist>, <asp:dropdownlist>, or any other ASP.NET list control (both those built-into the product or ones built by other developers). For the purposes of these samples I’m just going to use the <asp:gridview> -- but again know that you can use any. This is very useful when instantiating and adding classes within a collection like above (or within an anonymous type like we’ll see later). Note that rather than use an array this time, I am using a Generics based List collection of type “Location”. LINQ supports executing queries against any IEnumerable<T> collection, so can be used against any Generics or non-Generics based object collections you already have. 1) You get compile-time checking of all queries. Unlike SQL statements today (where you typically only find out at runtime if something is wrong), this means you will be able to check during development that your code is correct (for example: if I wrote “distanse” instead of “distance” above the compiler would catch it for me). 2) You will get intellisense within VS (and the free Visual Web Developer) when writing LINQ queries. This makes both typing faster, but also make it much easier to work against both simple and complex collection and datasource object models. Note how I am ordering the result by the distance (farthest to least). I am then using the “Skip” operator to skip over the first city, and the "Take" operator to only return the remaining 5. What is really powerful is that the .NET Standard Query Operators are not a hard-coded list, and can be added to and replaced by any developer. This enables very powerful domain specific implementations. For example, when the Skip() and Take() operators are used with DLINQ – it translates the calls into back-end SQL logic that performs server-side paging (so that only a few rows are returned from the SQL database – regardless of whether it is from a table with 100,000+ rows of data). 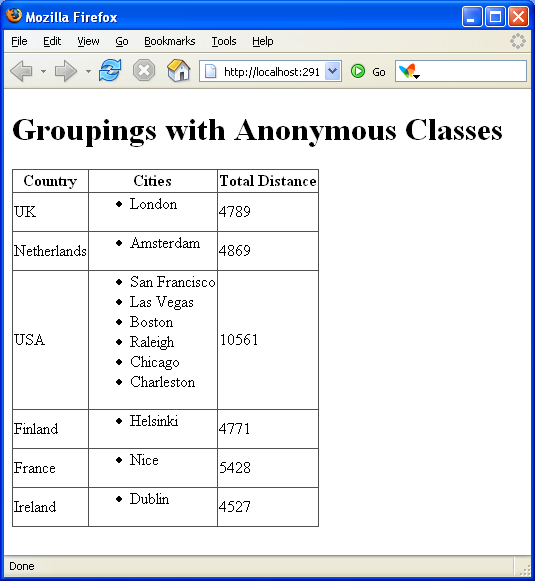 This means that you will be able to trivially build efficient web data paging over lots of relational data (note: until then you can use the techniques listed here). 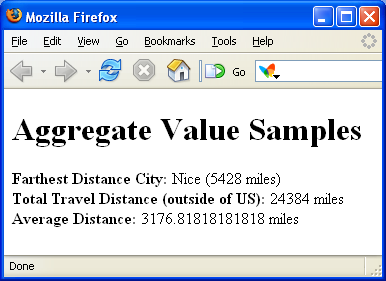 Note that the last two examples above use the new Lambda Expression support – which enable fragments of code (like delegates) that can operate on top of data to compute a result. You can build your own .NET Query Operators that use these (for example: you could build domain specific ones to calculate shipping costs or payroll tax). Everything is strongly-typed, and will support intellisense and compilation checking support. One of the new C# and VB language features that LINQ can take advantage of is support for “Anonymous Types”. This allows you to easily create and use type structures inline without having to formally declare their object model (instead it can be inferred by the initialization of the data). This is very useful to “custom shape” data with LINQ queries. Note that all of the databind syntax and hierarchical binding support in the .aspx page above is fully supported in ASP.NET 2.0 today – so you can use this same technique with any existing app you have now. What is new (and I think very cool) is the data shaping capabilities provided by anonymous types and LINQ – which makes binding hierarchical data against ASP.NET controls very easy. All of my samples above were against in-memory collections. They show you how you will be able to use LINQ against any .NET object model (includes all the ones you have already). In my next few LINQ-related blog postings I’ll show how you can go even further, and take advantage of the new DLINQ support to use the above techniques against relational databases as well as the new XLINQ support to work against XML files and structures. What is great about the LINQ project is that the syntax and concepts are the same across all of its uses – so once you learn how to use LINQ against an array or collection, you also know all the concepts needed to work against a database or even XML file. No custom SQL syntax or code is required – this is all that needs to be written to efficiently fetch and populate hierarchical data now (note: only the rows and columns needed will be fetched -- DLINQ can use the remote function support within LINQ so that it does not need to materialize or fetch the full database table or all columns from a row). And it is all type-safe, with full compiler checking, intellisense, and debugging supported. Even better, the ability to plug-in new LINQ providers (of which DLINQ and XLINQ are just two examples) is completely open – so developers who either build or use existing data providers today (for example: O/R database mappers) can easily integrate their implementations with LINQ to have a seamless developer experience. Once you know LINQ you will know all the basics needed to program against any of them. Hopefully this provides a glimpse of some of the cool new things coming. You can try it all out today by downloading the May CTP drop of LINQ today from here. You can also download and run all of the samples I built above from this .ZIP file here. Excellent! Thanks for the update Scott. I can't wait to start trying this stuff out. Keep up the good work. Why do you skip number 1 and not number 0 ? If I'm right, you are selected lines and s, it should start at 0. Can you give me more details ? Any ideas about the release date of Orcas? My guess is that you haven't installed the May CTP LINQ drop. Can you confirm that you have had? Also -- have you added a &quot;using System.Query&quot; statement to the top of the class where you are using the LINQ syntax? The error could be coming from that. P.S. Lastly -- if the above two suggestions don't work, please try running the sample using the built-in VS web-server to see if that makes a difference (it shouldn't -- but maybe it does). Skip() takes the number of results to skip in the sequence (and not the row to start with). I provided &quot;1&quot; as the argument so that it would skip over the first result. We are looking to ship the second half of next year. We will start having full Orcas CTP drops (of all technologies) starting later this summer, and will also have a go-live license of Orcas before the final RTM date. So not too far off now when you can use the above techniques in production. This DLINQ stuff looks very promising for providing a long awaited MS O/R Mapper. However, i have got excited by new datahandling functionality being introduced in the past only to find that the are usually many reasons why it can't be used in an enterprise n-tier project. When you provide DLINQ examples do you think you would be able to go that extra mile and show how it would be used in an n-tier application that may use business logic to validate, augment and/or transform the data before it gets written to the database? I wonder if VWD support it? 1. After I type using System., I can not see Query. 2. After I type GridView1., I can not see anything :-(, all the controls got this problem. Pleased you stated your C# examples are in C# 3.0. I the tried example from &quot;Step2: Using Richer Collections&quot; in VWD Express and there was a complaint on syntax. And your code will work great. Of course, when you move this to a separate PlacesVisited class, it is more difficult because you cannot return an anonymous type. However you could still do this and just return type Object (provided you perform your query within the method), as ASP.NET will still correctly will databind against it using reflection. And I am sure eventually Orcas will include a standard refactor to extract the type! Sure -- I will try and add some samples to the DLINQ tutorials to show that. 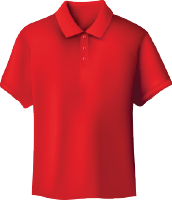 You can provide both property and entity validation with DLINQ. Note that LINQ itself is decoupled from DLINQ and XLINQ. That way if you prefer to use a different data implementation or O/R mapper you can. Our expectation is that existing enterprise data providers will move to support LINQ against them relatively quickly after Orcas ships to give developers even more flexibility to choose from. Scott, if you have not yet had a chance, I encourage you to look at Windows PowerShell. I completely ignored it at the 2005 PDC, but finally took a look after RC1 came out a few weeks ago. The funny thing is I have spent lots of time since the PDC thinking about LINQ, and now that I look at PowerShell I see the same concepts. A few weeks ago I didnt know what a Monad Comprehension was (actually I still dont...). VWD will definitely support it with the final release. I think you can make the May CTP work with VWD today (even though it says you need VS) - although I haven't tried myself (I don't have a machine that only has VWD installed). The language services support for C# 3.0 don't support intellisense that well yet, which is why you won't get full intellisense in your pages when you use LINQ statements (this applies both to the LINQ statements and other controls on the page). Obviously this will be fully supported by VS in the future though. Compilation error messages are accurate and correct though -- so even if you don't get intellisense you will get compile error checking with the May CTP. The syntax I used was for the C# 3.0 compiler to create the collection -- if you had to write code like you did above then I suspect the issue is that you still have the C# 2.0 compiler mapped to your project (which doesn't support those constructs yet). One other trick you might have noticed is that you can assign a anonymous instance to a variable defined using the &quot;var&quot; keyword. You can then program against the anonymous type in a strongly typed way (you'll even get intellisense in VS Orcas with it). The nice thing about Lambdas is that they provide a way you can write functions that are passed as arguments for later evaluation. This is useful for a lot of data scenarios (especially filtering and calculations), and the Lamdbda syntax is much terser than what you'd need to otherwise write today. They are also fully type-safe for compile-time and intellisense support. I was wondering whether Orcas is going to ship with a new major CLR and Framework version, or whether it will be built on top of the 2.0 framework. I'm particularly wondering because I feel strongly that anonymous types ought to have CLR-level support so that it's possible, at a language level, to provide a syntax for referring to them explicitly and have equivalent anonymous types remain equivalent across assemblies. So far, though, what information I've seen about Orcas has been almost entirely innovation at the language and library levels, with virtually no CLR support whatsoever. I hope that the feeling within MS isn't that the CLR is &quot;done&quot; and mature and not a space for further innovation, because there are other future features that I think are important that would need be added at a CLR level also. We are definitely adding new Framework libraries in Orcas. We are making some changes to the CLR for that release, but are also being careful to keep a high runtime compat bar to ease deployments (the following release will then have more engine additions). What isn't as convenient is cross assembly passing of this variable. Obviously you can do it as type &quot;Object&quot; -- but given that it is anonymous you can't then cast it in a type-safe way. I'll follow up with some folks to discuss whether there might be a nice syntax for doing this. The problem with passing as Object cross-assembly isn't a purely syntactical one (back before Cyrus dropped off the face of the earth I had some discussions with him about syntax for this so I know it's been on the C# team's radar at some point) but the fact that even if two assemblies contain identical anonymous types, those types are completely different at the runtime level because the runtime doesn't have any capability to express the concept of a type defined structurally outside the scope of a particular assembly. So even if a given language *wanted* to add a syntax which would let you cast to an anonymous type, it's simply not possible right now in cross-assembly calls, because the cast would always fail. Will Orcas be a new version of the .NET Framework (3.0) or will it be compatible with 2.0 as it is now? Another obvious question. Is it possible using the LINQ CTP and ASP.NET to completely pre-compile a website such that you can deploy it on a machine without without the LINQ CTP installed? For example, with the earlier LINQ CTP, I wrote a class library that used LINQ but from a method just returned a string as XML. Then from an ASP.NET app I bound against the XML (using the XmlDataSource and XPath). Nice thing was that this worked *perfectly* even thought the machine I ran it on did *not* have LINQ installed - it ran just fine with all the LINQ assemblied copied into the ASP.NET bin directory (including my class library that contained the only reference to LINQ). So my question: If you directly use LINQ from within an ASP.NET page (or code behind page), and you pre-compile the entire site, would it be possible to deploy on a machine without LINQ installed and just the correct assemblies copied into the bin directory? LINQ looks pretty sweet. One thing tho, when I try to enable paging on the GridView I get &quot;The data source does not support server-side data paging.&quot;. Will it be possible to use LINQ to do queries with the generic ODBC driver? it looks really cool. but i wonder how robust it is, and how scalable it is when the data collection increases in size. does LINQ offers any kinds of data indexing like database? like indexing an object field in a collection, like how database index a table column?? just curious. Orcas will be compatible with the 2.0 runtime. There will then be optional framework components you can install as well. You should be able to compile an app using LINQ and then deploy it on a vanilla ASP.NET 2.0 machine (providing you copy the LINQ assemblies to the \bin directory). In fact, if you use the VS 2005 Web Application Project this will work perfectly for you. P.S. I will definitely check out PowerShell -- thanks for the pointer! I will show how to enable paging with the GridView in a future tutorial. The simplest way to make it work is to use the ObjectDataSource and return LINQ results from it. You can do LINQ queries against any collection or object model. DLINQ will then have a pluggable provider API -- so someone could connect it to any data source. The built-in provider in the May CTP is for SQL, but others could build an ODBC one. LINQ works against any object model, and is as efficient as writing code against it today. DLINQ works against databases, and provides a way to use LINQ queries to perform data operations. The SQL it generates on the wire is pretty good (I will blog about that in the future). One nice thing about DLINQ is that you also always have the ability to escape it and provide custom SQL if you want. Great article. I'm looking forward to using C# in 3.0! I tried to deploy this application onto my hosting and unfortunately, it seems to need &quot;full trust&quot; permission which my hosting does't allow of it. &nbsp;Not sure if it's because it needs linq installed or if it's because my hosting. I will try to deploy this onto another machine and see. Unfortunately the May CTP does require full trust permissions to run. The final release, though, will support medium trust. I tried doing a query using the DataContext, but my class with a table attribute of &quot;Production.Product&quot; didn't work, saying it was an invalid entity. I had a valid connectionstring, pointing to the AdventureWorks database. Going to try this out as soon as find some time for it! Have you tried posting this to the LINQ/DLINQ forums? They might be the best people to help with this. Scott, When you give examples please make them relevant to real world scenarios. In what way is a business application going to benefit in using this rather than passing a sql statement or calling a stored proc. Why is Microsoft spending money on reinventing the wheel? It goes into more depth on some of the cool data scenarios that LINQ enables. Yep -- LINQ will work against any array or custom collection type. Basically it can perform queries against any sequence or collection that implements IEnumerable. We just tried it out on our new architecture, it works, pretty funky stuff really. When I new project ,I can't find dlinq project template, my installation is May CTP build. Yep -- you can definitely run LINQ over a custom object model just fine. As long as it support IEnumerable you can perform queries without having to modify your object model (which is pretty cool). I am not sure if I understood LINQ and the advantage of introducing this technology. Instead of writing the pre compilied stored procedures in database we are are trying to embed LINQ query ( which will generate SQL) inside the .net code. 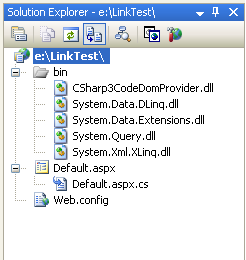 Isnt it a messy thing to embed linq Code into business or UI tier? Is it that one should write the linq query in DAL and create a method there to retrieve the collection of objects from DAL? I am new in LINQ.I dont know much more about LINQ.But work out samples which you given above really its supper.I want know whats actual purpose of LINQ and advantages compare to SQl statement. 4) It can be used against any datatype - it isn't limited to relational databases, you can also use it against XML, regular objects, etc. LINQ is very fast and uses pretty proven object relational mapping concepts, so I wouldn't say it is a research project. LINQ is not released yet, but will be next year. It will be fully supported and tested, and designed for both large and small systems. Thanks for answers Scott. But those are only words. Are there any proves? Like client testimonials? Why don't you have the same approach as when testing mssql with chosen clients and getting their feedback before release? Any technology related to data manipulation is extremely important and sensitive so why not do it as in case of mssql? Or do you have some pilot projects you could present us and that would be a prove of your words? I would be really happpy Scott to see it! Really! Just hit LINQ, DLINQ and Polita's excellent BLINQ... Excellent, been waiting for it a long time. Used BLINQ to whip up and admin site for a new db protoype, lots of brownie points! Any idea when the next release will be? I've seen posts saying second half next year, but to be honest, writing all my data access with NHibernate and then switching to LINQ will be a bummer, I'd prefer to go straight to LINQ as soon as possible. Once again, thanks for the intro. Unfortunately it is going to be early next year when we get LINQ ready for the next major release (which will be the productized version that is fully integrated into Visual Studio). I know it is really addictive (I love it). We'll try and get it out to you as soon as possible though. Hi Scott, caught your presentation at NDDNUG...thanks, it was great! Immediately started playing with LINQ and BLINQ. I pointed BLINQ at our main application and it generated a DataContext of around 100,000 lines of code. I also played with LINQ briefly to manually try and separate the DataContext out into smaller classes. What's your recommendation for larger databases where it doesn't seem realistic to use one DataContext? I've worked on some fairly large databases with 1000+ tables. Thanks again for coming to NDDNUG! That is a good scenario! Can you send me email (scottgu@microsoft.com) and I'll loop you in with a few folks from the LINQ team to discuss? They'd probably have some good recommendations for you. 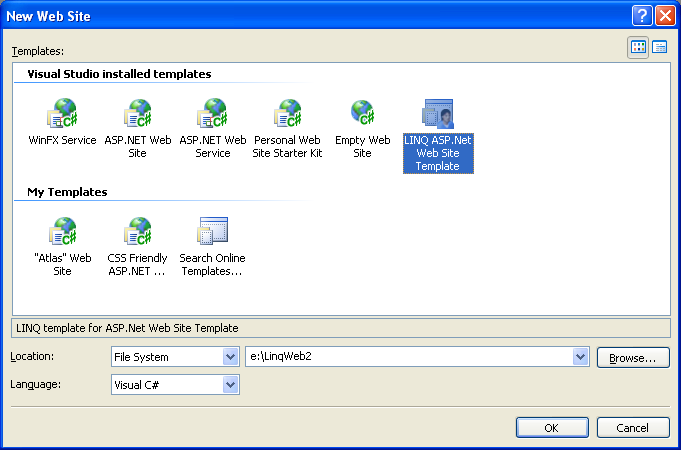 I have Microsoft .net linq preview (May 2006) installed and tried "Step 1: Creating your first ASP.NET page using LINQ", but the linq statement is unrecognized, "city", "in", "cities", and "ToUpper()" are all red underlined with "; expected"